Smoke’s Poutinerie has just signed a deal with BMO Field to sell its Toronto brand of poutine in the stadium’s CNE grounds parking lot during the upcoming Toronto FC season’s 40 games. Toronto is, there’s no point in denying it, a trendy city. Whether it be condos, indie cafes or burger joints, things pop up on our streets in waves. Poutine is one of the latest, and though Poutini’s initially got some of the best reviews (at least partially because it’s close to the Drake, in a neighbourhood where many of the folks who review such thing tend to live, or wish they did), it’s Smoke’s that’s really taking the curds by the horns and going large. After opening their first location over cult burrito joint Burrito Boyz on Adelaide West, and another on Dundas, Smiths Falls native and former graphic designer Ryan Smolkin is to open a third shop in late March on Queen Street just west of Bathurst. According to Smoke’s general manager Glenn Mori, the new shop will be about 900 square feet and will seat 15. The opening will represent as much as a 50 per cent increase in jobs for the company, adding between 10 and 15 positions to the quickly expanding company’s current 30. Executive Committee approves 1,249 new seats at BMO Field/National Soccer Stadium at sole cost of Maple Leaf Sports and Entertainment. This was a bit of a no-brainer (although anyone that has ever had the misfortune of covering municipal council at any level knows that “brain” can often be in short supply there). The seats will be elevated above the beer garden in the north end of the stadium. Many had hoped that the seats would replace the beer garden, but that was never in the cards. The insistence of everyone at MLSE on calling it the Carlsberg Beer Garden whenever it is referred to should give you a good indication as to why that was. The problem with the beer garden is that it’s just too tempting of a place for the more casual fans to watch the game from. Or, “watch” as the case may be. That, in turn, makes BMO Field look far emptier than it is (people in the beer garden aren’t in their seats, which, in turn, makes for lots of empty seats). It isn’t a big deal, but it would help for atmosphere if everyone was sitting in the stands instead of hitting on beer girls. The design of the new section might actually make the beer garden more enticing on cold or wet days, as it might provide some cover on the garden floor. We’ll have to wait to see what exactly it looks like when it’s up and running to be sure. When It’s Called Football last spoke to Paul Beirne about the expansion, he said that most of the new seats would be held back for sale to the general public as single game tickets. That should, at least, ensure that those sitting in the north end are invested in being there. With the North End Elite to play off of (as well as the visiting supporters on some occasions) it has the potential of being a pretty rowdy section. Hell, it will be on top of a beer garden! 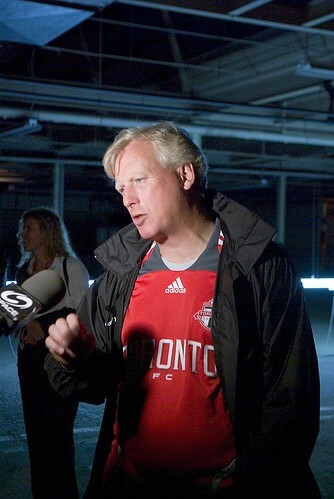 Mayor David Miller, who has attended Toronto FC soccer games with his family, said today he would like to see the professional football club play on grass instead of turf. But when the team and the city brokered a deal for BMO Field at Exhibition Place, part of the agreement hinged on community benefits: mainly the installation of a big bubble over the playing field in winter for the use of children and community indoor leagues. The Mayor said if the bubble is moved, FC can have grass – but he said football club owners Maple Leaf Sports and Entertainment would have to foot the bill for both moving of the bubble and the removal of the artificial surface. Toronto adding grass for Euro friendly? Rumor has it TFC is getting ready to announce a summer friendly with a major European team. Part of the deal is said to be a grass field brought into BMO for the game. Among the crystal figurines and other soccer-related objects d’art in the founders lounge at BMO Field, a seat cushion designed as a beer cap holds pride of place. “We don’t want to forget that day,” Paul Beirne, Toronto FC’s senior director of business operations, said with a laugh. It’s a reminder of their first home win on May 12, 2007, crowned by Danny Dichio’s historic goal, when 20,000 delirious fans began flinging their souvenir stool pads frisbee-style, cluttering the pitch. “It could’ve been an unfortunate incident,” said Beirne, who had fears the game against Chicago would be halted or that Major League Soccer would be on the horn any second. “But they were nice and foamy and it was such a spontaneous burst of emotion. That became a benchmark for us in terms of what we wanted to be, going forward. TFC has indeed led a charmed life heading into the home opener of its third season tomorrow (4 p.m.) against the Seattle Sounders. Positioned among the top three in MLS attendance and general revenues, and second in jersey sales only to the Los Angeles Galaxy and absentee star David Beckham, TFC is the fledgling league’s most dynamic franchise. Some teams have trouble drawing 14,000 to a game where TFC has that many on its season-ticket waiting list, parked behind 16,000 subscribers in a 20,000-seat soccer-specific stadium — proving again that if it can’t produce winning teams, Maple Leaf Sports and Entertainment Ltd. can certainly print money. But the true measure of TFC’s success has been criss-crossing the great divide of the GTA’s splintered soccer community and coming up with something all factions could support. That was roughly the same approach of the Toronto Blizzard of the North American Soccer League during the 1980s and teams such as the Metros-Croatia and Lynx went down that road before and after the Blizzard. None, however, could pull it off. Yet when MLSEL did a post-mortem of the defunct teams, the common thread was that ground-level fan support had not been the big obstacle. The Blizzard had been so attractive at one point that it outgrew 19,000-seat Varsity Stadium and moved to the Ex. But the fake turf and the baseball/football surroundings were a turnoff, especially to an old-world soccer audience. “It did give us a lot of hope that if done right, we could harness that energy this time,” Beirne said. And time was on TFC’s side when it went hunting for a franchise in 2005. “Canada is 20 or 25 years more mature now, so the cosmopolitan nature of the city has only become stronger for football,” Beirne said. “Greece had just won (Euro 2004) and Italy was about to win the World Cup. 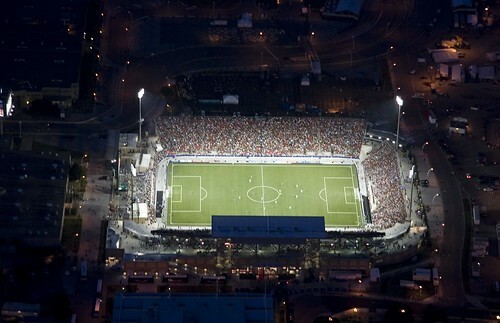 That’s when it became apparent that soccer was still alive and well in Toronto. Each successive club victory in Europe or South America — or any club victory, for that matter — caused some sort of celebration in town. In the World Cup, if the Portuguese were out, they jumped on the back of Brazil and that kind of switching of allegiances happened as the tournament went along. TFC initially expected something of a battle to sell tickets, figuring much of the target demographic would be the sprawling minor soccer community. But that was before the Red Patch Boys, U-Sector, Tribal Rhythm Nation and Northend Elite emptied that disposable income from their 18-45 age bracket right into TFC’s coffers. In no time, the 2007 expansion season and just about everything since has been sold out. Fan clubs that had supported the Lynx or other small clubs reformed, new ones sprang up, team songs were composed and instantly turned BMO into a loud and proud house of pain for opponents. Compared with the reserved crowds for the Maple Leafs and Blue Jays, TFC fans reminded the city how much fun a game could be. Beirne, who had been with Mirvish Productions, also worked for MLSEL keeping thousands of Leafs and Raptors subscribers happy. DeBlasis thinks TFC is now “everyone’s second-favourite soccer team” after their own national or club loyalties. “I can’t speak for all the ethnic media, but from the view of the Italians there’s a sense of professionalism now that wasn’t there in past teams,” DeBlasis said. “They did it right, they laid down the management structure, hired credible people such as (manager) Mo Johnston, marketed under a single team name with the city prominent in it and made ticketing affordable. TFC has tried to whittle down the long wait list for subscribers by offering some mini-packages of games. But if it wants to clear a few thousand off the books and is serious about getting more group sales to minor soccer teams, then BMO will have to be enlarged. That’s a thorny issue, with most fans and players liking the cozy confines as is. MLSEL thinks it can put 8,000 seats in, mostly in the south end, without upsetting too many people. MLSEL originally paid a $10 million expansion fee in 2005, compared with $30 million for the Sounders and a reported $40 million that the Montreal Impact was going to be charged before backing out. “We got the early-bird special,” MLSEL executive vice-president Tom Anselmi said jokingly. Now all they have to do is make it work on the pitch. Good stadium food has to meet two main requirements: One, it has to be the kind of food you want to wash down with an ice cold beer, which usually means a meat and carb-rich item. Most sports fans are beer drinkers, and this is how they want to chow down. Show me the person at the big game hankering for arugula skewers with a nice crisp chardonnay and I will show you someone apt to be beat up in the parking lot after the final buzzer. Two, good stadium food has to be easy to eat, which in the best-case scenario means you can eat it with one hand. Few people want to have to sit there with their knees together making a little table on which they use a knife and fork to cut their spaghetti. That kind of arrangement is way too messy and awkward when the excitement of a goal causes you to leap to your feet. But in a city as culturally rich as Toronto, the food at any major sporting event should reflect the city’s range, especially when it comes to a team like the Toronto FC. “We have a very diverse fan base,” says Robert Bartley, executive chef and director of culinary for Maple Leaf Sports and Entertainment. Today, MLSE held a taste-testing event to reveal the new items that will be on the menu at BMO Field this year. How do the new foods stack up? Originality factor: Mac n’ cheese may not be new, but Mac n’ cheese in a breaded ball deserves top points for solving the conundrum of how to let sports fans eat it with one hand. Why it scores: The breaded coating makes for a great texture with the smooth and creamy inside. Reason to red card it: There’s four in a serving, and after putting three balls in your mouth the fourth is bound to taste a little bland. Chef’s description: A hand held taste of Mumbai. Seasoned chicken in fragrant curry sauce and Basmati rice, rolled and served crispy, hot and with traditional mango chutney. Originality factor: Let’s give the people at MLSE points for showing India a little love. 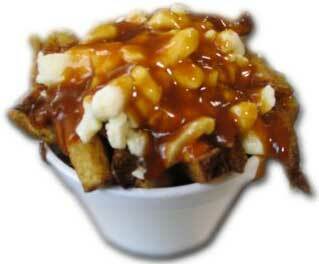 You’re not going to get this at a Leafs game. Why it scores: Packed with rice and served in a thick roti roll, it’ll create solid base for fans that need food to soak up suds. Reason to red card it: It’s a bit on the dry side. Make sure to load it up with the chutney. Originality factor: Not much. It’s just a hot dog, after all. Why it scores: It’s a very good hot dog. The team at MLSE actually tested more than 100 kinds of hot dogs earlier this year, so you know you’ve got the best dog going. Reason to red card it: You can get a hot dog anywhere. Go for something more out of the ordinary. Why it scores: The tomato sauce is awesome and it’s loaded with cheese. Reason to red card it: With the exception of a favourite xxxxx, Ye Olde Chip Butty, it’s one of the greasiest menu items. Originality factor: The chicken and mushroom mix in the sausage makes for a fairly deep flavour profile compared to your ordinary sausage. Why it scores: The caramelized onions it comes topped with are rich and delicious, and the bun it comes served on is just about perfect. Reason to red card it: Big bun, large sausage: you might want to avoid this one if you’re not prepared to do some serious mouth breathing. Why it scores: It manages to have all the heft of a burger and the tomato jam it’s served with is mouth-watering. It’s also pretty huge. Reason to red card it: All that ciabatta bread can make it a little dry.